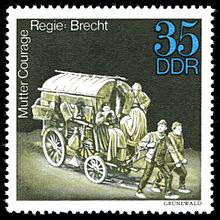 On 5/25 at 7pm there is another showing of Mutter Courage und ihre Kinder by Bert Brecht at the Burgtheater in Vienna, Austria. In times, when, around 100 years after the beginning of world war one, politicians and media use warmongering propaganda to convince the people that there is no alternative to another cold or hot war, is is good to listen to literature that says peace is better than war and that there are thousands of alternatives to war. TATA instead of TINA!